Watch the New York band get tossed around. 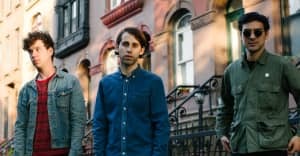 New York-based trio EZTV has collaborated with the Children's Museum of the Arts for a cute and crafty cut-and-paste new video. Visually speaking, it's got major Angela Anaconda vibes, but the mellow tune, "Pretty Torn Up," is probably more enjoyable than that dated Nickelodeon show ever was. "Unlike most of our album, we recorded 'Pretty Torn Up' completely at home, in Ezra's old bedroom in Clinton Hill," drummer Michael Stasiak told The FADER over email. "[The video] was pieced together in a ramshackle sort of way; we loved that the kids came back to us with the simple, direct idea of literally tearing us up and tossing us around a New York skyline—it was just so perfect. And because so much of the video focuses on Ezra's words, they really seemed to get at the heart of feeling romantically tumbled in the city." The song is featured on the band's debut album, Calling Out, which is out now on Captured Tracks. Peep some tour dates below, too.